It is finally here and hopefully it will bring sunny, spring time along with it! 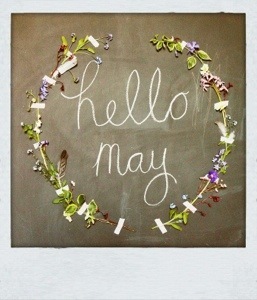 In honor of a new month I want to host a little challenge: Make it Happen May! Ok I am sure you get the idea now! Maybe you will even take the challenge a step further and change two things! I always feel like a new month means it is time to clean the slate and set a new goal for myself. For Make it Happen May I plan to do morning workouts at least 3 days during the school week. I will either indulge in my Jillian Michaels library of workout videos, run, or walk. Yes I said it- morning workouts. Setting my alarm for 4:50 to do a morning work out does not sound like fun at all, but it is time to MAKE IT HAPPEN! This challenge will require me to set multiple alarms, sleep in my workout clothes and maybe even ask people to text me at 4:55 to make sure I am out of bed and MOVING! Don’t judge- sometimes you have to crazy things to make it happen! So how about you? What will you do to make it happen in May? What a great idea!! I’ll do it! I’m going to wake up early to workout and run at least 1 mile a day in May! Thanks for joining in! I did my first morning workout today. Started with a 2 mile walk. I love this idea! I just need to think of something haha. I’m up at 5am three days a week for lifting workouts…let me know if you need a hand or advice for stupid early mornings! Thanks! I am always a fan of the plank-a-day or try to do a mile every days! Let me know what you decide! !